Council leaders have called for an end to "negativity" over plans for a £200m health and leisure project. Two reports had given Carmarthenshire council a "clean bill of health" over its handling of the Wellness Village in Llanelli, the authority's leader Emlyn Dole told cabinet colleagues. Links with Swansea University were cut when staff there were suspended. The Welsh and UK governments are reviewing the project but Mr Dole said it could still go ahead. 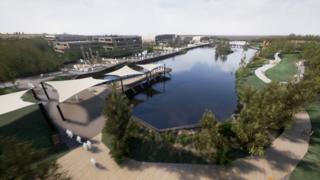 One of 11 City Deal projects for the Swansea Bay region, the village at Delta Lakes is predicted to create up to 2,000 jobs in health, leisure and research facilities. In November, Swansea University suspended four members of staff in a move which was later confirmed as being linked to its role as a partner in the project. Carmarthenshire council terminated its collaboration agreement with the university and private partner Sterling Health, and ordered a review of its handling of the project by Acuity Legal and requested further oversight from the Wales Audit Office (WAO). Acuity Legal said the council had "followed a robust process, which demonstrates many facets of good governance and management of risk", while the WAO added that the authority had "effectively managed risk to protect public money". Welcoming the reports, Councillor Dole said: "There has been no misuse of, or risk to, public funds." He said the council still intended to deliver phase one of the village in 2021, as planned, and "was open to looking at all options" to ensure delivery. Glynog Davies, executive member for education, said: "There is still a great deal of negativity regarding this project. "It is so, so important. It offers so much to the people of Carmarthenshire - it will hopefully create jobs. "So why this negativity all the time? I very much hope now that we can move on." Cefin Campbell, the member responsible for culture, said the university suspensions had "shed a dark cloud" over the project but claimed it was time to look ahead. The university is investigating the suspensions - now involving five employees - and has made a formal criminal complaint as part of the process.